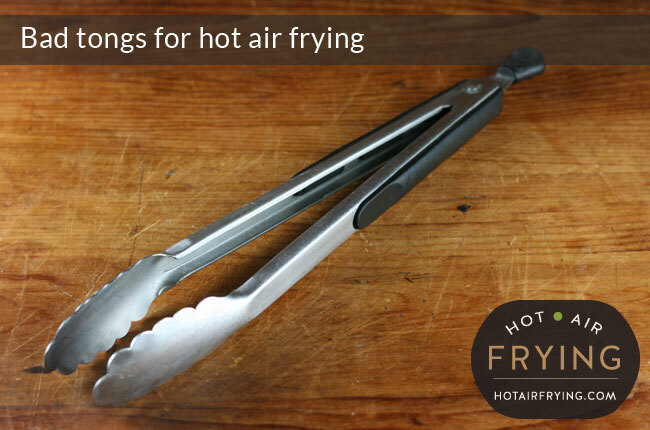 When you start to do a lot of hot air frying you will find that kitchen tongs can be a very useful cooking tool to have in your kitchen. They are not only useful for gripping and serving stick-shaped food like fries / chips; they are also useful in manipulating more “wedge” or chunk shaped food such as potato wedges, and roasted veg such as potatoes, broccoli, cauliflower, etc. Tongs are also ideal for use in handling stir fries. 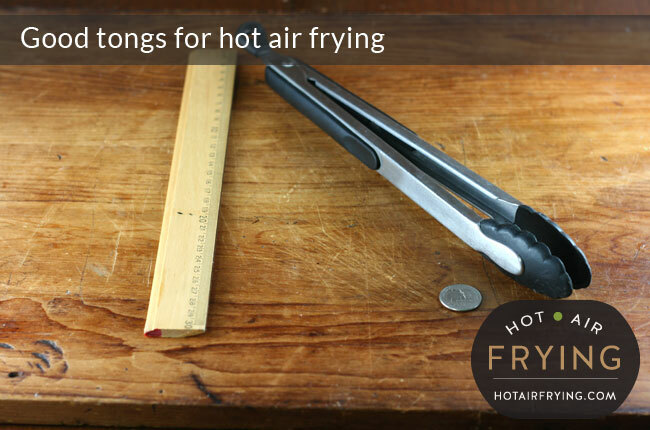 In paddle-type hot air fryers, it can be easier to work around any central spindle with tongs than with a spoon. Ultimately, I would say you will end up wanting two pairs of tongs (I have three, as shown in the starting picture.) You will probably find in reality that one is always in the dishwasher waiting to be washed up. 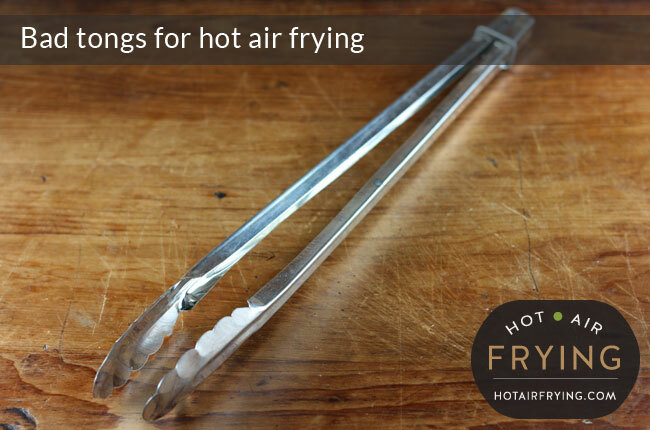 A set of good quality tongs also makes a very welcome birthday or Christmas present to anyone who already has a hot air fryer. Any tongs are better than none: but if you’re setting out to acquire a pair of tongs for the first time, there are better and worse pairs that you can consider. The light aluminum (feeling, anyway) tongs above are probably the cheapest you can buy, and even if they are all you can afford, I would say “save your money”; that no tongs are better than these. 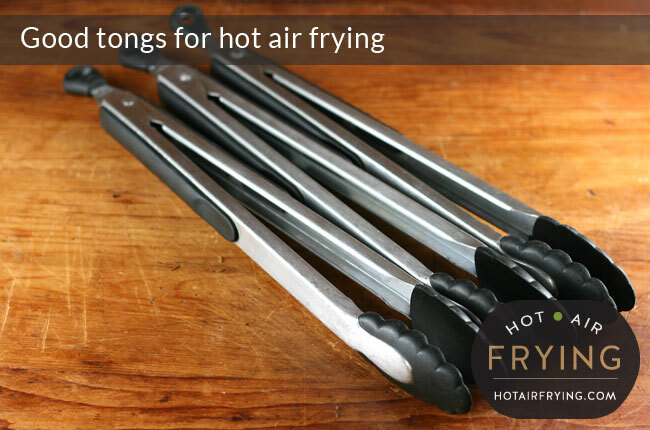 Most hot air frying pans / baskets have a lot of non-stick surfaces, and the metal ends of the tongs will scratch them. Also I don’t know how to describe it, but these tongs have no strength to them. You can’t get a good squeeze going; I don’t quite know why, but you can’t. And, finally, the end “tong” grippy bits have no grip to them to speak of. Stuff grasped between them will just slip out. The “slidey” square ring at the top will sort of lock them closed for easier storage, but don’t count on it: it will often slip about and as the tongs get a bit older, slip off entirely. And it’s awkward to use. You’re better off with a good sturdy cooking spoon than these, frankly. These tongs may look a lot better, and are. Except for one very important failing, which is that the metal end bits can scratch the non-stick surfaces of your hot air fryers. The metal tips are exactly what you want over an open flame, or with deep fat frying, but their metal nature is a fatal flaw as far as our hot air fryer surfaces go. For that one very important reason, these tongs get a failing grade, too. 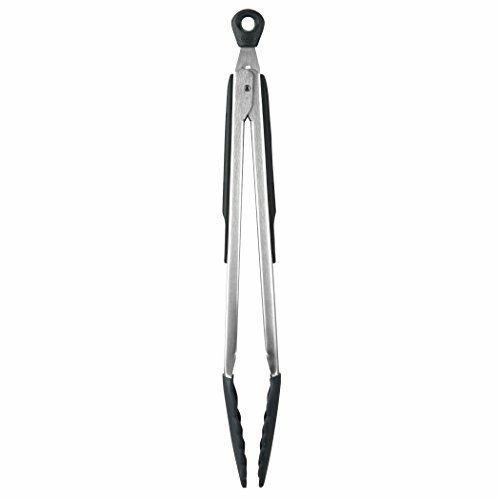 These are long tongs, about 30 cm (12 inches), which means that your hands can work at a great distance away from the hot food / surfaces. There may be different brands that incorporate such features. I’m not advocating any particular brand, rather just a set of features that makes a set of tongs both good for hot air frying, and, a pleasure to work with as a cook.